So Lionel Messi has strolled off with yet another Ballon d'Or this week and you can't say that he's anything but deserving. But inevitably people have begun to champion Messi as the greatest of all time yet again, and while he is a phenomenal player that has torn up the record books in recent years he still hasn't quite measured up to his brilliant countryman Diego Maradona in my opinion. More than half of the tackles in Maradona's day would be fouls now, and many of them would draw cards. In fact it was only in the last few years of his career that the rule against tackling from behind came in. Maradona wasn't protected by referees like Messi is. Tying into my first point, the rules against aggressive tackling are far less lenient now than they were in Diego's day and with FIFA trying to encourage attacking play, it's an open secret that players like Messi get special protection from referees. While Messi has had the obvious benefit of playing for one of the best club sides ever in Barcelona, with many of his club teammates making up the Spanish national side that swept to two European crowns and a World Cup title, Maradona played for a decent Napoli side that he drove on to the only two Serie A titles in the club's history in 1987 and 1990. Playing in a league that only has two giants in Real Madrid and his Barcelona side, with a resurgent Atletico only challenging them in recent seasons, Messi has had opportunities to collect trophies for fun. Maradona though played for Napoli at a time when Serie A was the undisputed best league in the world. The Italian league was dripping with quality in the 1980's and early 1990's with sides like AC Milan, Juventus and Inter providing stiff competition for his Napoli side. 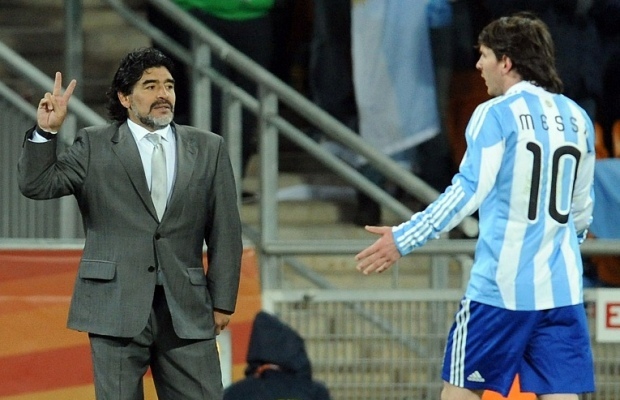 Despite the competition, Maradona was still able to help guide his team to glory. Maradona carried a solid, but unspectacular Argentina side to a World Cup title in 1986 and took a terrible side to the final in 1990 where they would only narrowly lose to West Germany on a late penalty.